Temperatures across the Rio Grande Valley are projected to fall as a cold front arrives Friday afternoon, according to a forecast by the National Weather Service in Brownsville. Highs should remain in the 80s and 90s through Friday, and drop more than 30 degrees in the afternoon. The front brings an increased chance of rain which remains through Monday. 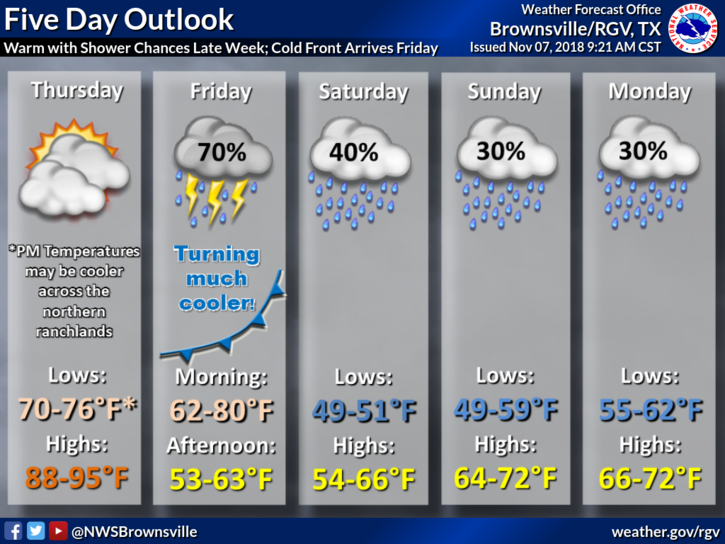 This weekend will see cloudy skies and the potential of precipitation, with lows in the 40s and 50s. Temperatures should reach the 50s and 60s on Saturday, and stay in the 60s and 70s through Monday.